Danish studio Kilo Design has created a mask to protect and educate children living in areas with very high levels of air pollution. The device, which was created for technology startup Airmotion Laboratories, is designed for kids aged six and older. It's intended to be both playful, featuring simple shapes and bright colours, and educational – the mask arrives disassembled so children and parents can put it together themselves. Woobi Play is aimed at areas with exceptionally high levels of pollution. UNICEF statistics report there are 300 million children inhabiting places with the most toxic levels ever recorded. 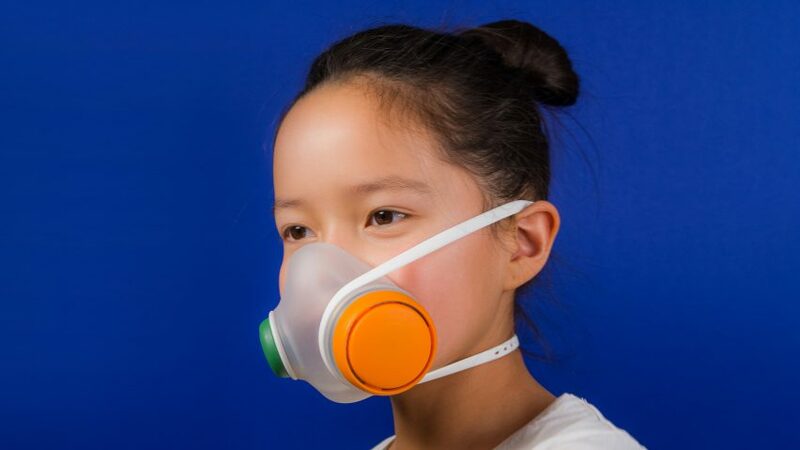 The mask's HEPA filter protects the wearer from 95 per cent of airborne particles. "Woobi offers a solution to improve the living conditions of these kids around the world," said Kilo Design founder Lars Larsen. "This project is a bold shot at designing a simple, new typology that transforms a professional, protective mask to fit a child's universe." The mask offers an alternative to more traditional protective wear, which often hides the face. Woobi uses translucent silicone over the mouth. By colouring the different parts of the mask, the studio hopes to teach children about how it works. Interchangeable pieces also allow kids to customise it, hopefully introducing a greater sense of ownership. Airmotion Laboratories plans to launch a pilot of the mask – which will retail for €36 (£31) – in China later this year. As cities around the world suffer from rising levels of pollution, designers are creating new products in response – including a range of shirts that change colour to warn the wearer that they're being exposed to pollution. Dutch designer Daan Roosegaarde is attempting to tackle the issue on a larger scale, creating giant smog vacuum cleaners that can purify the air in large sections of cities.